transitional subcritical state. Typical feature of this state is a decrease in neutron flux. The above definition is, in fact, a definition of the transitional subcritical state, in which the reactivity of a reactor is lower than zero (keff < 1; ρ < 0). In this case, the production of all neutrons by fission is insufficient to balance neutron losses and the chain reaction is not self-sustaining. 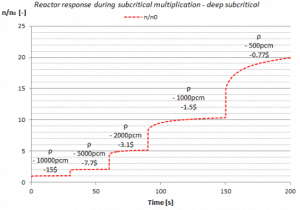 steady-state subcritical state – subcritical multiplication. 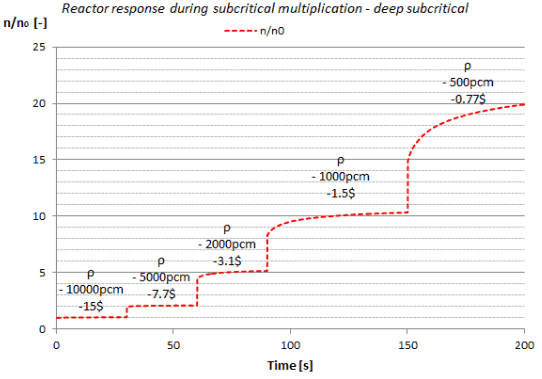 Typical feature of subcritical multiplication is a presence of source neutrons (supplied by external or internal neutron source). The source neutrons balances neutron losses and the neutron flux is constant. If an external neutron source is present, then any transitional subcritical state inevitably pass in subcritical multiplication. If not, the neutron flux will approach zero. As can be seen, the neutron flux in a subcritical reactor with source neutrons stabilizes itself at a corresponding level, which is determined by source strength, S, and by the multiplication factor, keff. On the other hand, the amount of time it takes to reach the steady-state neutron level is dependent only on keff. 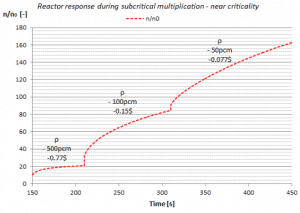 In general, subcritical multiplication is the phenomenon that accounts for the changes in neutron flux that takes place in a subcritical reactor with source neutrons due to reactivity changes. The term “source neutrons” refers to neutrons other than prompt or delayed fission neutrons. In general, they come from sources other than neutron-induced fission. These neutrons are very important during reactor startup and shutdown operations when the reactor is subcritical, because they allow to monitor the subcriticality of a reactor usually via source range excore neutron detectors. (α,n) reactions. In certain light isotopes the ‘last’ neutron in the nucleus is weakly bound and is released when the compound nucleus formed following α-particle bombardment decays. For example, the bombardment of beryllium by α-particles leads to the production of neutrons by the following exothermic reaction: 4He + 9Be→12C + n + 5.7 MeV. This reaction yields a weak source of neutrons with an energy spectrum resembling that from a fission source. Another very important source is (α,n) reaction with oxygen-18. This element is present in the uranium oxide fuel. The neutron producing reaction is: 18O(α,n)21Ne. Alpha particles are commonly emitted by all of the heavy radioactive nuclei occuring in fuel (uranium), as well as the transuranic elements (neptunium, plutonium or americium). (γ,n) reactions – photoneutrons. Neutrons can be produced also in (γ, n) reactions and therefore they are usually referred to as photoneutrons. A high energy photon (gamma ray) can under certain conditions eject a neutron from a nucleus. It occurs when its energy exceeds the binding energy of the neutron in the nucleus. The lowest threshold have 9Be with 1.666 MeV and 2D with 2.226 MeV. Therefore photoneutrons are very important especially in nuclear reactors with D2O moderator (CANDU reactors) or with Be reflectors (some experimental reactors). External Source of Neutrons. Sometimes source neutrons must be artificially added to the system. External source of neutrons contains a material, that emits neutrons and cladding to provide a barrier between reactor coolant and the material. External sources are usually loaded directly into the reactor core (e.g. into guide thimble tubes). Primary Source of Neutrons. Primary source of neutrons does not need to be irradiated to produce neutrons. These sources can be used especially in case of a first core (i.e. a core that consist of fresh fuel only). Primary source of neutrons are based on the spontaneous fission reaction. The most commonly used spontaneous fission source is the radioactive isotope californium-252. Cf-252 and all other spontaneous fission neutron sources are produced by irradiating uranium or another transuranic element in a nuclear reactor, where neutrons are absorbed in the starting material and its subsequent reaction products, transmuting the starting material into the SF isotope. (α,n) reactions can be also used to produce neutrons. The bombardment of beryllium by α-particles leads to the production of neutrons by the following exothermic reaction: 4He + 9Be→12C + n + 5.7 MeV. This reaction yields a weak source of neutrons with an energy spectrum resembling that from a fission source and is used nowadays in portable neutron sources. Radium, plutonium or americium can be used as an α-emitter. Secondary Source of Neutrons. Secondary source of neutrons must be irradiated to produce neutrons. These sources usually contains two components. The second component is a neutron emitter element, for example, 9Be, which has the lowest threshold (1.666 MeV) for neutron emission. The first component is a material, which can be irradiated by fission neutrons (e.g. antimony) and then emits particle capable to knock out a neutron from the second component. The (γ,n) source that uses antimony-124 as the gamma emitter is characterized in the following endothermic reaction. The antimony-berylium source produces nearly monoenergetic neutrons with dominant peak at 24keV. The primary and secondary sources are similar to a control rod in mechanical construction. Both types of source rods are clad in stainless steel. Since at PWRs the source range neutron detectors are usually placed outside the reactor (excore). A source neutrons assemblies should be placed at least a few migration lengths from core periphery. The main reason is that source range detectors should not register primarily the source neutrons. Sb-Be neutron source is typical external neutron source used in commercial nuclear reactors. It is usually loaded into fuel assemblies near the periphery of the core, because the source-range excore detectors are installed outside the pressure vessel. Sb-Be source is a two component source and prior to irradiation contains natural antimony (57.4% of 121Sb and 42.6% of 123Sb) and natural beryllium (100% of 9Be). The first component serves as a source of strong gamma rays, while the second component is a neutron emitter element. Thus the Sb-Be source is based on (γ,n) reaction (i.e. it emits photoneutrons). The neutron flux inside the core activates (σa = 0.02 barn) the isotope 123Sb resulting in 124Sb. 124Sb decays (with half-life of 60.2 days) via beta decay to 124Te. The decay scheme of 124Sb shows two relevant groups of γ-ray energies, namely 1691 keV and 2091 keV with absolute intensities of 0.484 and 0.057 per decay respectively. These γ-rays have sufficient energy to knock out a neutron from the second component, 9Be, which has the lowest threshold (1.66 MeV) for neutron emission. The (γ,n) source that uses antimony-124 as the gamma emitter is characterized in the following endothermic reaction. They have an extremely high photon to neutron ratio which complicates the work with such sources. Yield of neutrons is significantly lower than for (α,n) sources. On the other hand (α,n) sources contains transuranic elements as americium which can be converted into fissile isotope 242mAm. These source are not appropriate for commercial reactors. Source neutrons play an important role in reactor safety, especially during shutdown state and reactor startup. Without source neutrons, there would be no subcritical multiplication and the neutron population in the subcritical system would gradually approach to zero. 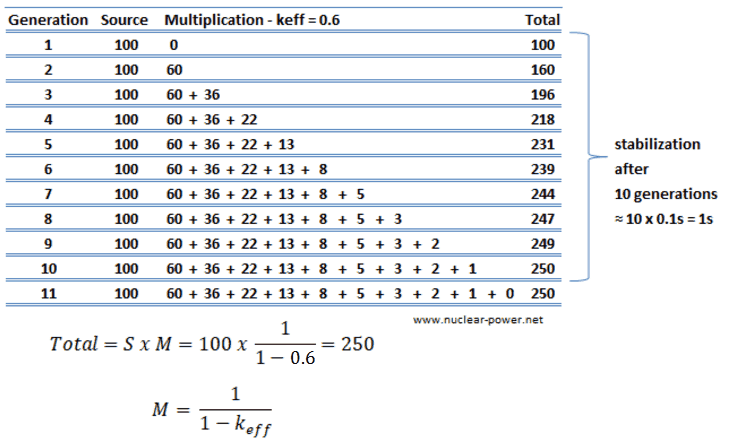 That means, each neutron generation would have fewer neutrons than the previous one because keff is less than 1.0. With source neutrons, the population remains at levels that can be measured by the source range excore neutron detectors, so that operators can always monitor how fast the neutron population is changing (can always monitor the reactivity of subcritical reactor). Note that, if neutrons and fissionable material are present in the subcritical reactor, fission will take place (even a deep subcritical reactor will always be producing a small number of fissions). The source neutrons enter the life cycle and experience the same environment that fission neutrons experience. It must be noted, source neutrons are produced at different energies (e.g. 24keV for Sb-Be source), usually below energies of fission neutrons. When the reactor is made subcritical after operating at a critical state, the neutron population at first undergoes a prompt drop as a result of rapid decrease in prompt neutrons. After a short time begins to decrease exponentially with a period corresponding to decay of the longest-lived delayed neutron precursors (i.e. ~80s). With source neutrons, the neutron flux stabilizes itself at a corresponding level, which is determined by source strength, S, and by the multiplication factor, keff. 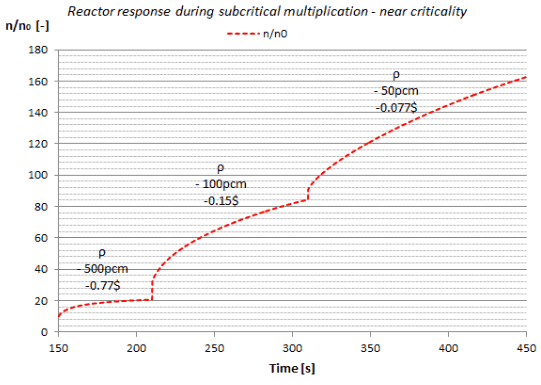 As can be seen, the neutron population of a subcritical reactor with source neutrons does not drop to zero, the neutron population stabilizes itself at level n, which is equal to source multiplied by factor M.
the external source provides n0 = 100 neutrons/s. That means, when 100 neutrons are suddenly introduced into the reactor via source n0. These neutrons will produce 60 neutrons (100 x 0.6) from fission to start the next generation. Duration of each neutron generation is equal to ld = 0.1s. From 60 neutrons of the second generation the system will produce 36 neutrons (60 x 0.6) to start the third generation (during ld = 0.1s). The number of neutrons produced by fission in subsequent generations due to the introduction of 100 source neutrons into the reactor is shown in the figure. As can be seen, the neutron population stabilizes itself at level n = 250, which is equal to source multiplied by factor M. The addition of source neutrons to the reactor containing fissionable material has the effect of maintaining a much higher stable neutron level due to the fissions occurring than the neutron level that would result from the source neutrons alone. As can be seen, the amount of time it takes to reach the steady-state neutron level is approximately equal to time of 10 neutron generations (i.e. 10 x 0.1s = 1s). Now, we will illustrate, what happens to the neutron population when the value of keff is changed. During a reactor startup, for example, an initially subcritical reactor is driven to criticality via a series of discrete control rod withdrawals. During these withdrawals a reactivity increases. After each control rod withdrawal, the operator must wait to allow the reactor to attain the steady-state neutron level. The amount of time it takes to reach the steady-state neutron level after a reactivity change increases as keff approaches the critical state. That means, when 100 neutrons are suddenly introduced into the reactor via source n0. These neutrons will produce 90 neutrons (100 x 0.9) from fission to start the next generation. Duration of each neutron generation is equal to ld = 0.1s. From 90 neutrons of the second generation the system will produce 81 neutrons (90 x 0.9) to start the third generation (during ld = 0.1s). The number of neutrons produced by fission in subsequent generations due to the introduction of 100 source neutrons into the reactor is shown in the figure. As can be seen, the neutron population stabilizes itself at level n = 1000, which is equal to source multiplied by factor M. As can be seen, the amount of time it takes to reach the steady-state neutron level is significantly higher, since it is approximately equal to time of 50 neutron generations (i.e. 50 x 0.1s = 5s). The reason is evident in the series expression in the figure for keff = 0.9. As keff increases, more terms in the series are significant, meaning that more previous generations of source neutrons contribute to the present population. It must be noted, the real PWR cores reach reactivities around keff = 0.92 – 0.95 at the beginning of the reactor startup. Values around 0.6 are not common. 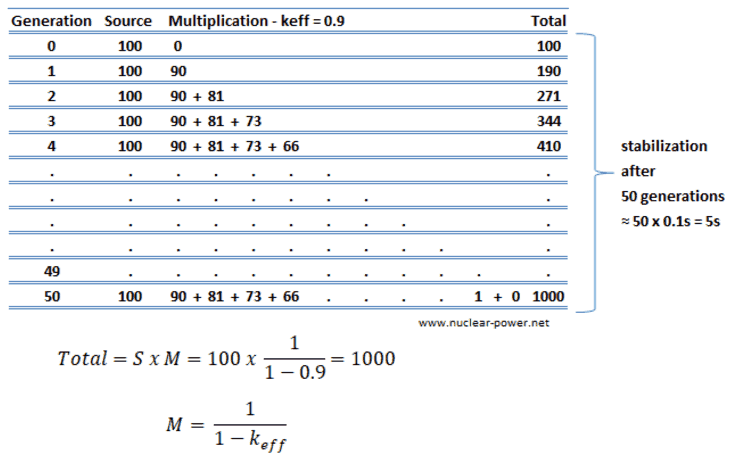 Because the subcritical multiplication factor is related to the value of keff (core subcriticality), it is possible to monitor the approach to criticality through the use of the subcritical multiplication factor. The closer the reactor is to criticality, the faster M will increase for equal step insertions of positive reactivity. When the reactor becomes critical, M will be infinitely large. Monitoring and plotting M during a criticality approach is impractical because there is no value of M at which the reactor clearly becomes critical. On the other hand, the neutron flux is monitored via source-range detectors, where count rate (CR) gets infinitely large as the core approaches keff = 1.0. Note that, the count rate of source-range detectors is proportional to the neutron population (n ∝ CR). which can be determined by source-range count rate. Note that, a true 1/M plot requires knowledge of the neutron source strength. Because the actual source strength is usually unknown, a reference count rate is substituted. As criticality is approached, 1/CR approaches zero. Therefore in startup procedure the value of 1/CR provides engineers with an effective tool for monitoring the approach to criticality. Assume a criticality approach by control rod withdrawal. For this procedure operators check especially the control rods position (usually in steps) and the count rate (CR) from source-range detectors. The initial count rate on the detectors prior to rod withdrawal is 100 cps. There are main parameters in the following table. From these parameters the 1/M Plot is constructed. As can be seen, the estimated critical parameters can be predicted with extrapolation to the point, where CR0/CR → 0. 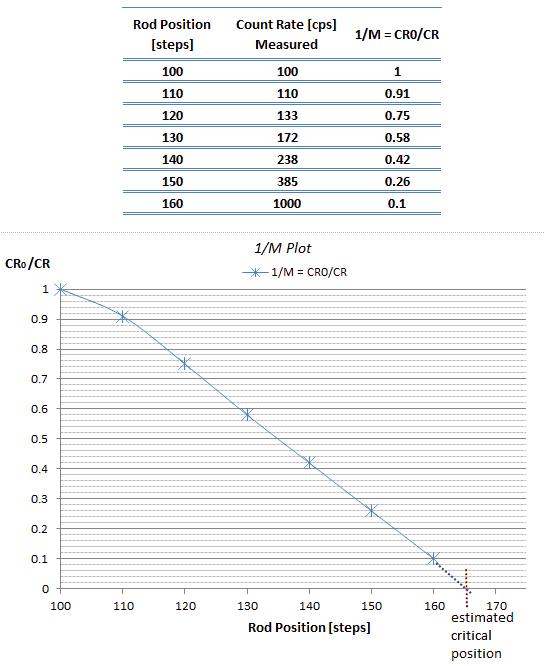 1/M Plot can be constructed to monitor a criticality approach. It is a very useful tool for operators, since the estimated critical parameters can be predicted with extrapolation to the point, where CR0/CR → 0.